Geeta Hippie clothes. Geeta Bohemian clothing. Artsy clothing for expressive women! Since 1972 Geeta of India has lead the way in creating classic gypsy hippie chick bohemian shabby chic styles for women and juniors. Handmade boutique styles at affordable prices. 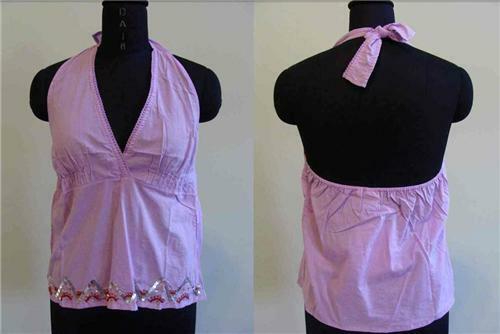 100% smooth cotton backless halter top with gorgeous seqin work along front hemline. Elastic in back provides for a perfect fit. Also looks great worn with a GEETA layering tee shirt. Even though these tops are marked with a size, they really all measure the same so they are listed as "one size". Because of the handmade nature of these garments, sizing varies. The measurements here represent an average measure of this garment. Bust measurements are taken with the garment stretched. Check the measurements below.